'Personal Display' presents an open invitation for anyone you encounter to involve themselves in developing the message on the mosaic of texts you are displaying. 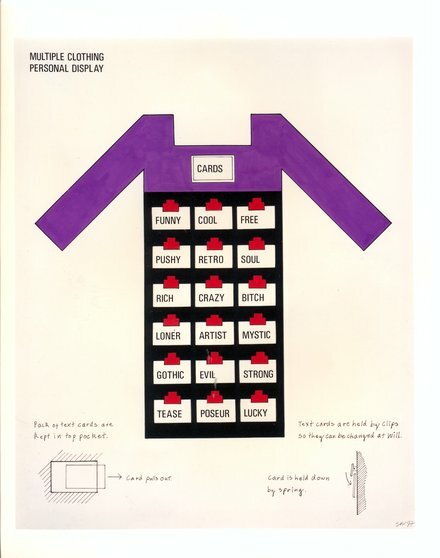 The mosaic is made up of words associated with the basics of interpersonal preception that are displayed on text cards, a full set being kept in a pocket at the top of the garment. Text cards are taken out of the pocket and selected to form different combinations that are then attached to Personal Display by clips so as to build up the mosaic. The full set of text cards forms a thesaurus of possibilities, denoting basic areas in interpersonal perceptions, such as identity, action, intention, but any combination and preference can be made and all are equally valid, there being no right or wrong way to organise the mosaic.